Requirements: Photoshop CS6 and all version of Photoshop CC, including the most recent CC 2017. TKActions panels went modular with the release of the V5 panel . So now, instead of updating a mega panel, the individual modules can be improved and released when they are finshed. While there have been two minor updates to V5 modules, the RapidMask2 module is the first major upgrade. It effectively replaces the V5 Intro, RapidMask, and LayerMask modules, so it marks the beginning of the new TKActions V6 panel. 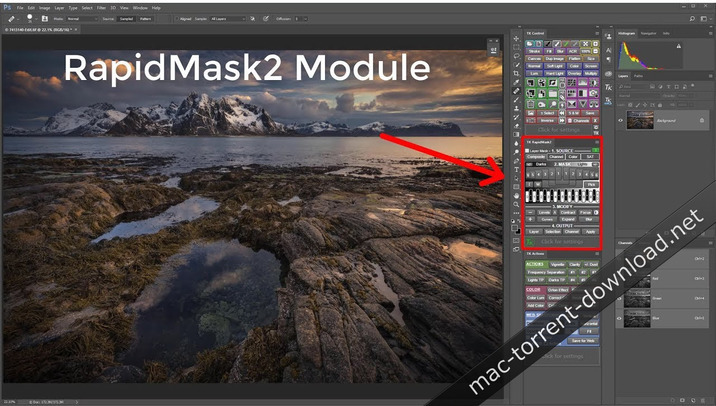 The TKActions V6 RapidMask2 module is another big step forward for luminosity masks and custom Photoshop extension panels. Some screen shots of it are shown above. The one on the far left shows the actual module. Different functions that can be accessed are shown in the other three images. RapidMask2 is designed exclusively for Photoshop CC to take advantage of the HTML5 architecture that Photoshop CC can accommodate. The Rapid Mask engine still powers the new module but its function has been significantly improved. The interface was also extensively revised and there are many new functions and featuress. Four distinct sections (SOURCE, MASK, MODIFY, and OUTPUT) that mirror the mask-making process. New menu design for choosing different pixel data as the starting point for making masks. Updated and compact spectrum interface for choosing different masks. Color masks that target specific colors can be generated and converted to Rapid Masks. Two buttons, Plus(+) and Minus(-), make it so all masks can be added and subtracted just like using a calculator. New pixel layer choices for outputting the current Rapid Mask as a layer mask. Provides an image-based option to quickly choose or create the best mask by having the mask applied directly as a layer mask on the active layer. Only one accent color for the entire module that users can change to whatever they prefer. Buttons retain an accent-colored shadow after clicking so users can track which mask they last chose.